I have a two copies of the Brent Weeks and Greg Bear mini-flip book that Orbit was giving out at Book Expo this year. I grabbed two not realizing it was a flip so that's more for my fine readers. 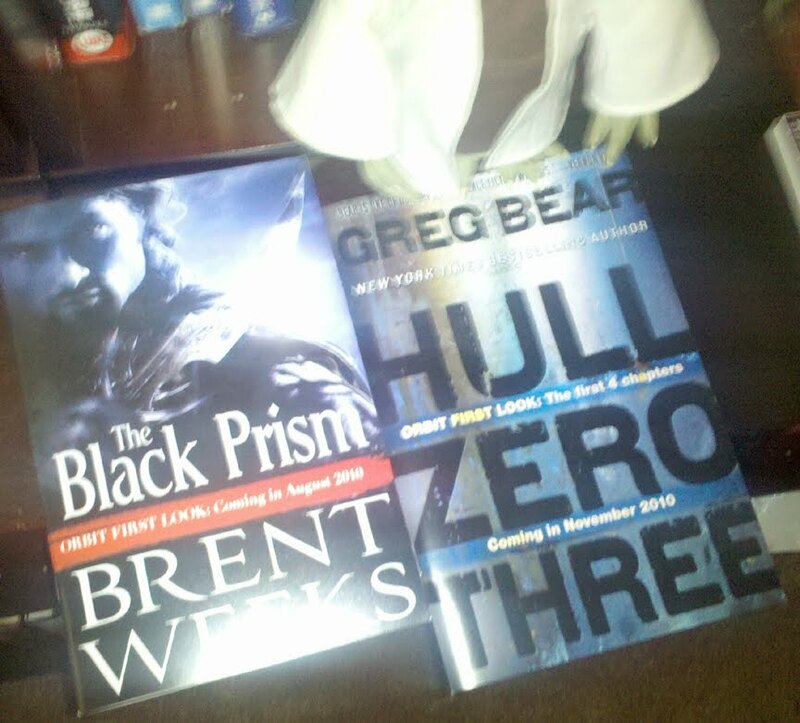 The Weeks half is the first three chapters of The Black Prism and the Greg Bear portion is the first four chapters of Hull Zero Three. This is a very nice chapbook style production with a sturdy cover and the text printed on nice gloss so it should make a good collectible for the Weeks and Bear fans out there. To enter send an email to madhatterreview (AT) gmail (dot) com with your full name and snail mail address and "WEEKS-BEAR" in the subject line. Include the name of your favorite Weeks or Bear character along with the title of the book they appear in. The deadline is midnight June 15th. I'll announce the winner on the following day or as soon as I remember. This contest is open to the people of the United States and Canada only since I'm paying for shipping. If you send multiple entries you will be disqualified from the contest.